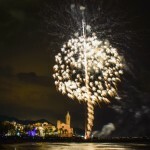 After the main festival of summer, most of the habitants and tourists of Sitges have already returned to their corresponding routines and said goodbye to the holidays until next year. However, the September party is about to arrive and, even though we have entered into the life of work and studies, each year it gives us that last summer memory to be able to endure all winter with energy: Santa Tecla! If you still didn’t know this party, we think that the best way to describe it is like a reduced and familiar version of the August festival. Being September, the spectators are reduced to habitants of the town and surroundings since most of the tourists have left, and therefore it becomes a much more comfortable, quieter and therefore more pleasant party, especially for the children. All the popular dances and all the groups that act in the main party act but also join the children’s groups, which have been practicing for months to execute their best outings. Apart from the traditional, there is also a long list of related and parallel activities such as concerts, workshops, vermouths … for more than a week! Opening of the photo exhibition of the best 50 photographies of “XIX Concurs de Fotografia de Festa Major” (photo contest of Festa Major) and corresponding awards to the winners. This exhibition will remain open until 30th September. 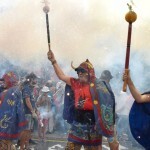 With the participation of: Espetegafoc, Diables de Les Corts, Ball de Diables de Sabadell, Ball de Diables de Torredembarra, Àliga de Sitges, Ball de Diables de Sitges and la Cuca de Castellbisbal. With Vivèrrids, Miquel del Roig and the group of versions Angangas. After the concentration, a parade and a final dance all together. Route: Plaça de l’Ajuntament, Major, Cap de la Vila, Parellades, Sant Pere, passeig de la Ribera and Fragata. With: Ball de Bastons, Panderetes, Pastorets, Cercolets, Cintes, Gitanes and Moixiganga. Route: passeig de la Ribera until la Fragata. 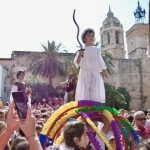 They will act in this order: Agrupació de Balls Populars de Sitges, Colla Vella and Colla Jove. You can not imagine what can appear in a bathtub! Will we find the Pukka duck? Will we hear the sound of the sea? PETA bubbles? What is the cry of the hippopotamus? And the song of the whale? Come and discover it! Musical story by the youngest students and teachers of the Municipal Music School Montserrat Almirall. 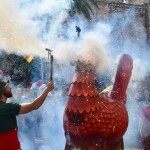 The Municipal Commission of the Festa Major de Sant Bartomeu and Santa Tecla, representing the municipal authorities, will recieve the icon of Santa Tecla from parish vicar Josep Pausas and to the sound of the Agrupació Musical Suburband of El Retiro, will parade it this year to the Fundació Ave Maria (Avenida de Artur Carbonell, 11 ), place designated by the Pendonist, Montse Quelón i Piqueras. The route will follow the streets of Baluard, plaça de l’Ajuntament, Major, Cap de la Vila, Jesús, Sant Bartomeu y Artur Carbonell. Once the image is at the destination, PRAYER OF THE OPENING OF THE EXHIBITION OF THE IMAGE OF SANTA TECLA. Children’s show and party sweetened with CHOCOLATE for all the children. By the end, VESTIM ELS GEGANTS MOROS (Let us dress the “Gegants Moros”), we will dress La-hia and Fa-luch with the help of the children. With Brigitte Laverne, Amaia & The Free Fall Band, El petit de Cal Eril, Mujeres and Dj Amable. Once the rehearsal is finished, there will be snacks for the participants. With dj’s DierKamps and Blacksubur. By Agrupació de Balls Populars de Sitges, in commemoration of their 40 anniversary. 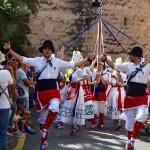 The group of traditional dancers and musicians and the authorities, with the musical group Agrupació Musical Suburband, will recover the shrine of Santa Tecla from the place designated by the “pendonista” of Santa Tecla 2018, Montserrat Quelon i Piqueras, and and they will accompany it to the parish church. Route: Artur Carbonell, Sant Bartomeu, Sant Gaudenci, Sant Josep, Parellades, Marquès de Montroig, plaça de la Indústria, Primer de Maig, Santa Tecla, Bassa Rodona, passeig de la Ribera, Sant Pau, Parellades, Cap de la Vila, Major and Ajuntament. 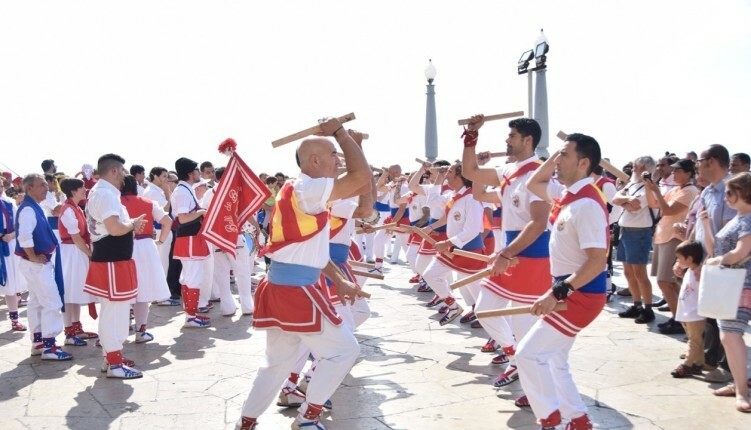 In front of the doors of the parish church, the popular dances receive the image of Santa Tecla which, accompanied by the authorities, the “Pendonista” and “Cordonistes” will be placed in the presbytery to preside over the liturgies of the festival. 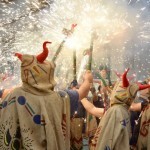 Infant beasts will alternate among the groups of devils that will participate in this order: Diables de l’Agrupació de Balls Populars, Colla Vella de Diables and Colla Jove de Diables. Route: Davallada, Barcelona, Àngel Vidal, Cap de la Vila, Parellades, Sant Josep, Espalter, plaça del Pou Vedre, Bassa Rodona, Santa Tecla, Primer de Maig, Paseo de la Ribera (sea side) and La Fragata. Route: Fonollar, Baluard Vidal i Quadras, Port de n’Alegre, Rafel Llopart, Sant Damià, Sant Sebastià, Jesús, Sant Bartomeu, Sant Gaudenci, Sant Francesc, Cap de la Vila, Parellades, Sant Pere, Paseo de la Ribera (mountain side) until la Fragata. Route: plaça de l’Ajuntament, carrer d’en Bosch, Davallada, Barcelona, Àngel Vidal, Cap de la Vila, Parellades, Major, Nou, Paseo de la Ribera until la Fragata. Presided over by Father Josep Pausas, rector. 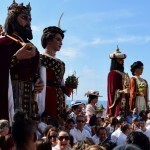 This year, Agrupació de Balls Populars de Sitges, will make the offering to Santa Tecla commemorating its 40th anniversary. At the end of the celebration, song of the “Goigs” (praises) of the Saint in charge of the Choir of the Amics del Orgue. Musical parade of the Band, which will accompany the authorities to the Town Hall. Then, all the dances and their respective musicians will perform, together with the Cobla Maricel and the Suburband del Retiro Music Group, they will come together in one of most magical moments of the festivities. Sociedad Recreativa El Retiro with la Cobla Maricel interpretará “Concert per cobla & gralles”. Circuit around town with the authorities, the Saint carried by “Pubilles” and “Hereus” and the folkloric dances and musicians, accompanied by all the Sitgetanas and Sitgetans who wish it. The rector of the parish, Mn. Josep Pausas i Mas will preside over the processional act joined by the Illustrious Town Hall dignataries. 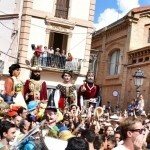 Route: Baluard, Fonollar, Sant Joan, Davallada, Barcelona, Santiago Rusiñol, Jesús, Sant Bartomeu, Sant Gaudenci, Sant Francesc, Cap de la Vila, Parellades, Bonaire, passeig de la Ribera, Nou, Major, plaça de l’Ajuntament and Baluard. As the procession advances along the Paseo de la Ribera, the religous procession will be saluted by firing mortars and the ringing of bells, La Cobla Sitgetana will interpret the sardanas “Els Gegants de Sitges” composed by Tomàs Gil i Membrado and “La Processó de Santa Tecla”, composed by Antoni Català i Vidal. Then, inside the temple, closing prayer “Us he mirat Santa Tecla”. 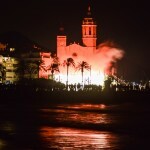 You can read the full programme in www.visitsitges.com. Now you know what to do if you want to end your summer as it should. We’re waiting for you!